Summary: In the 19th (!) 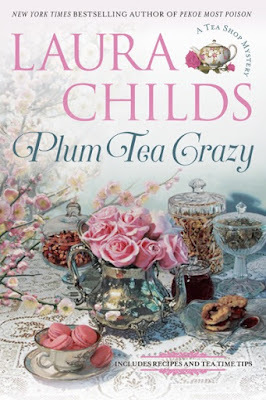 tea shop mystery from Laura Childs, we find Theodosia and Drayton at the Charleston mansion of historical society bigwig Timothy Neville. They’re among the guests gathered to view the Gaslight and Galleons Parade in the harbor, and as they watch from the widow’s walk of Timothy’s house, a fellow guest, Charleston banker Carson Lanier, falls to his death. They soon learn he was shot—and by a crossbow. 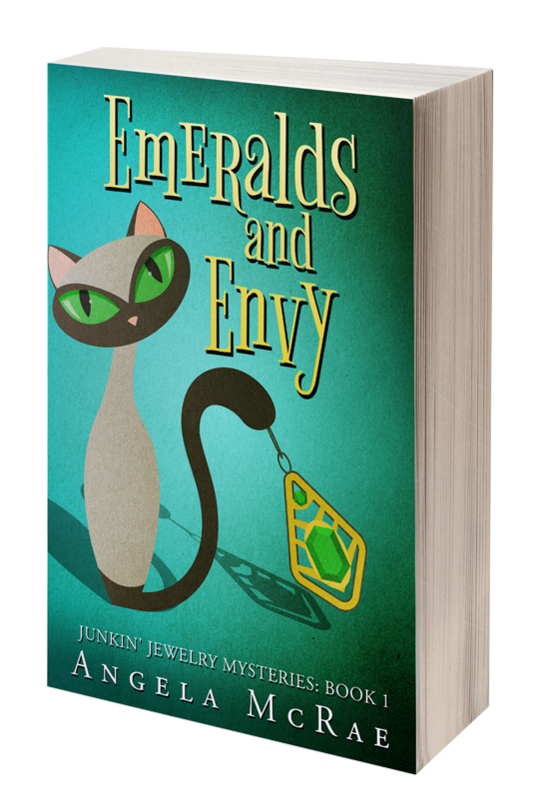 The judgment: This one's definitely a winner, and one of my favorite things about this book was the new characters it introduced, including Jamie, Hailey’s cousin, and Alexis, the owner of a new Japanese art gallery. In my town, the retail life waxes and wanes just like this, with new faces constantly coming and going, and I like how Theodosia and company are always welcoming to the newcomers. Even one who calls Drayton “Dude,” which cracked me up! 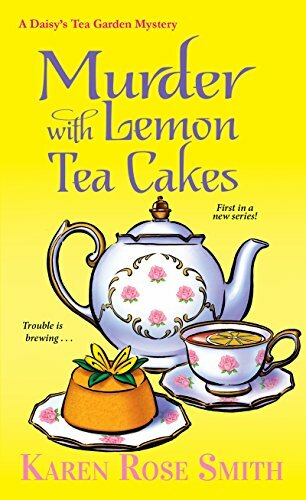 • This story literally started with a bang, and I was surprised (but not bothered) to find an early focus on the actual murder, since most cozy mystery murders occur offscreen. What did you think about the opening scene? • Who are you favorite characters in this series? Mine are definitely Theo and Drayton. There’s a haughty yet somehow likable fellow in my town who reminds me so much of Drayton that I picture him every time Drayton is mentioned. Do you have strong mental images of the characters? 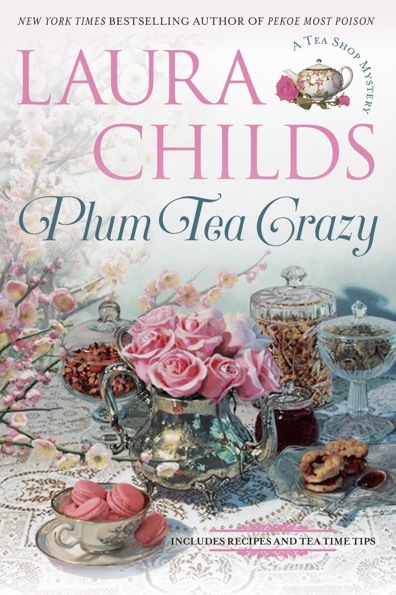 • All those mentions of plums made me want to try a new plum tea. The one I used to adore was called Snow Monkey Plum, and I don’t know who made it, only that the tearoom that served it is now closed. Do you like plum-flavored teas? Have one to recommend? Next Month's Book: I’m going with another tea-themed mystery next month, simply because I’ve read so many good things about Murder with Lemon Tea Cakes by Karen Rose Smith that I have to check it out for myself. 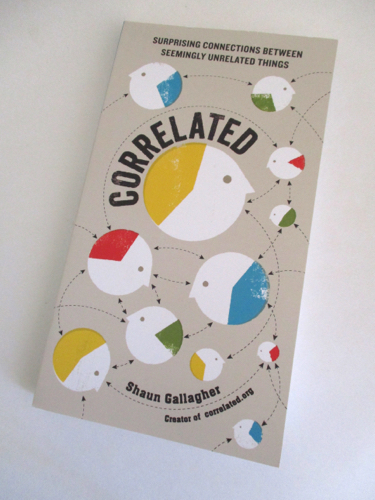 I hope you’ll join me in reading it, and we’ll discuss it here on April 27. 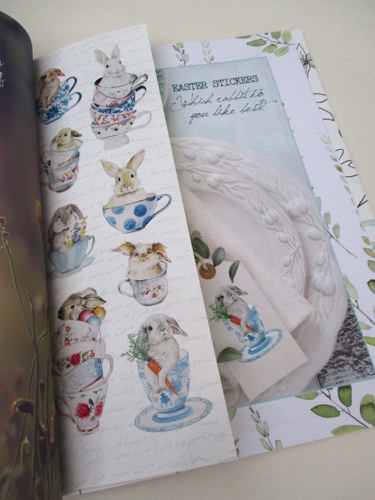 Bunny-in-teacup stickers! Need I say more? 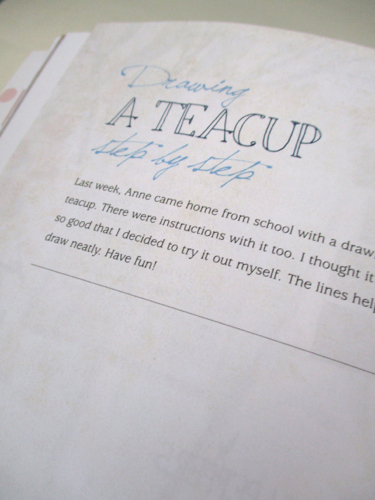 And I think it would spoil the surprise if I showed you the page on how to draw a teacup, but what a fun feature to find inside the latest issue. 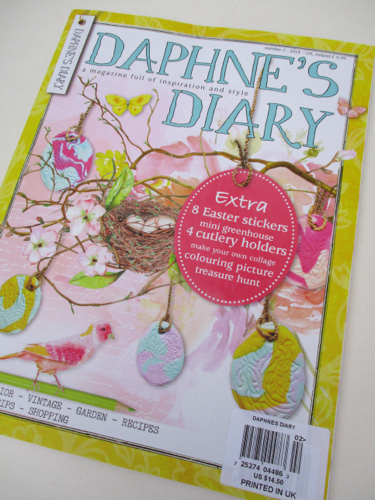 These magazines don't seem to stick around long in my neck of the woods, so if you want those bunny stickers, I suggest you hop to it and get thee to a newsstand ASAP. Happy reading! I love the Easter season! 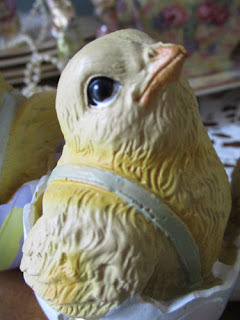 We had a great Palm Sunday service at church yesterday (one of the little rug rats poked me with his palm frond as he made his triumphal entry into the children's wing), and when I got home, I realized I needed to hop to it if I was going to bring Easter to my tea trolley! It's the time of year I usually first pull out my Royal Winton Welbeck chintzware. 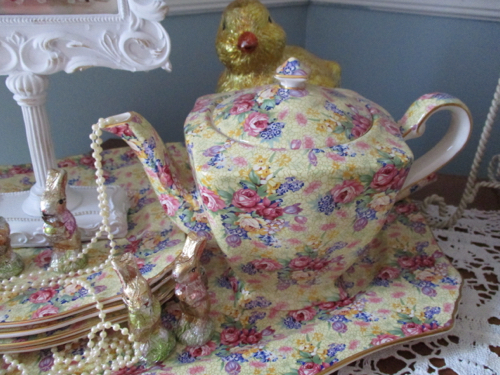 This year, I decided the teapot would be "pouring pearls" for a while. Do any of you remember when the JoAnn stores carried "chintzware" fabric some years ago? 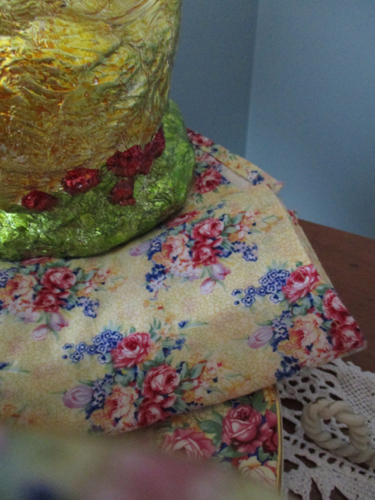 My late mother made these napkins for me to go with my Welbeck pieces, and I would let go of my chintzware itself before I would part with these napkins. 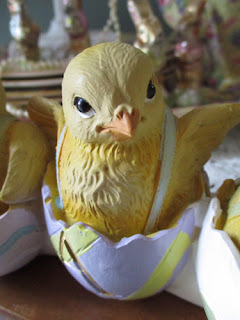 And I will always be grateful that after my mom passed away, her first birthday happened to fall on Easter or "Resurrection Sunday," as we say. It is one of the Lord's many mercies to me that the calendar fell the way it did in 2014! A new addition to my collection of yellow linens this year is this lovely mug mat made for me by my pen pal, Sandy, in New York. I'd been using it in my office at my desk, but then I realized it needed to have a starring role on the tea trolley for a few weeks. 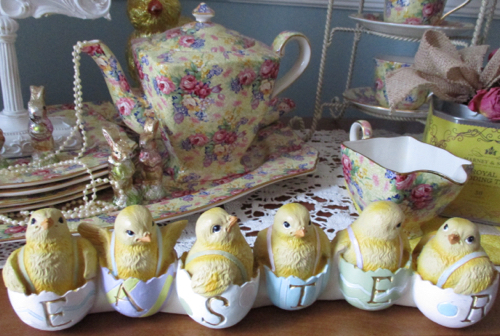 The piece with the Easter chicks spelling out "Easter" at the front of the cart was a recent T.J. Maxx find. I'm quite amused at them, because if you look closely, they all have different expressions. The one at left looks mischievous, and the one at right looks like she's dreaming of her next selfie. 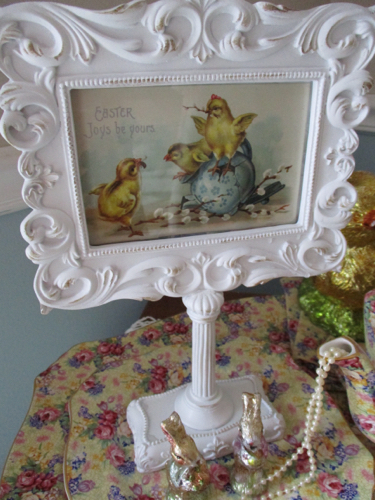 This frame was a gift from my friend Susan, and I thought it was perfect for displaying a vintage Easter postcard of chicks spilling out of a teapot. "EASTER Joys be yours" indeed! 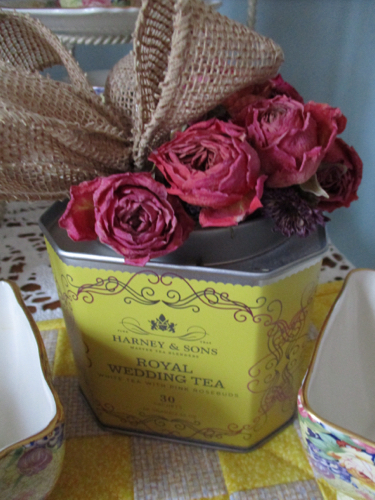 So that's this year's speed-decorating of the tea cart. I hope you enjoyed it, and I hope you all have a wonderful Holy Week! 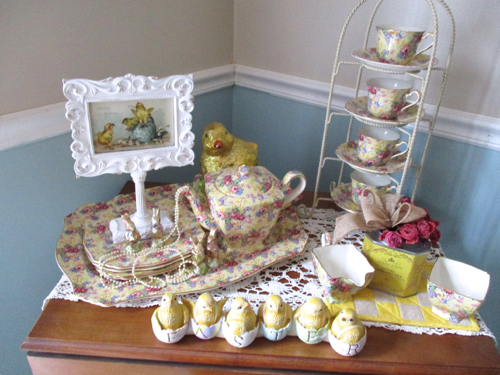 Just about this time a year ago, my sister and I were getting ready to have a yard sale together, and I learned she was getting rid of some teacups that had belonged to her husband's grandmother, Ada Mae. She told me I could take all of them I wanted, but I showed (for me) great restraint and took only this one, featuring a daffodil design in a shape of teacup I'd long admired. 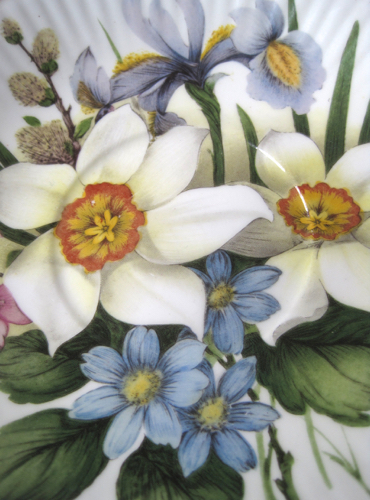 The pattern is so pretty and springlike, isn't it! I am now especially glad I accepted the gift, because Ada Mae passed away recently at age 92, and I love having this pretty teacup to remember her by. 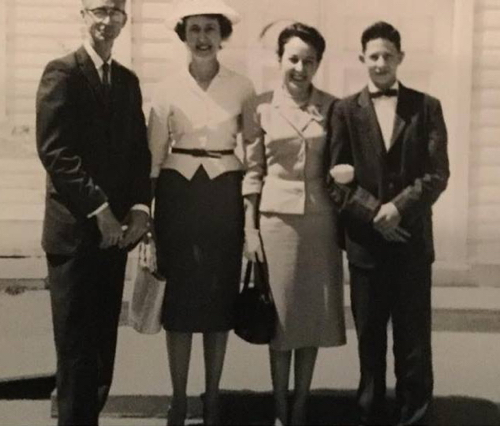 When my brother-in-law shared this picture of his late grandmother (second from left), I was charmed! I hadn't seen her in at least five years, but I have fond memories of her visits from Texas to Georgia at the holidays back when she was able. She was a pretty white-haired lady the entire time I knew her, so it's fun to see her as a brunette and wearing such a fabulous outfit back in her younger days. 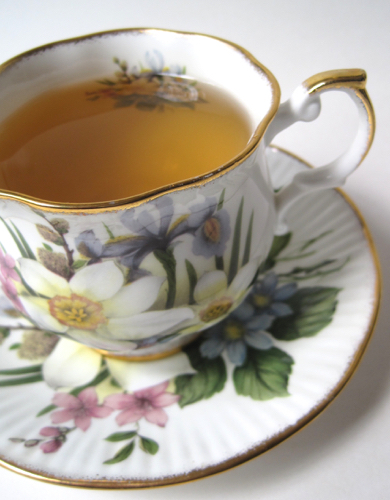 And so today, I lift my teacup in honor of … Ada Mae! I honestly had no idea a tea connection was in this book, so imagine my surprise when I'm reading along one night and came across this. Now, let me just say that regarding item number one, I do not wish to know your thoughts. TMI and NSFTB (Not Suitable For Tea Blog). But I am interested in the second item. It says 60 percent of people prefer mechanical pencils (to non-mechanical pencils, I assume). But among those who prefer tea to coffee (that includes me! 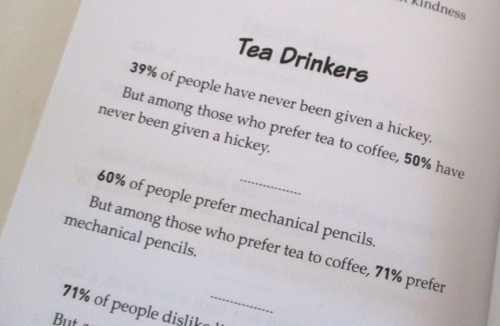 ), 71 percent prefer mechanical pencils (and I do *not* prefer mechanical pencils to non-mechanical ones). Do you? Just curious whether this tidbit holds up with readers of this blog! 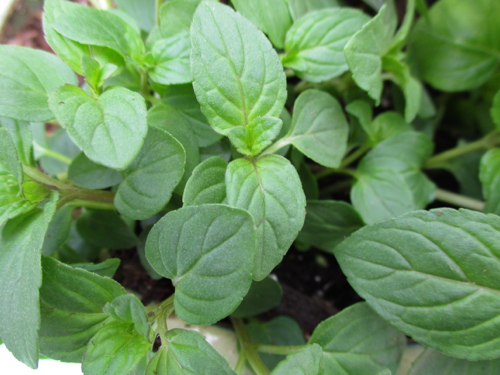 I believe the danger of frost has past, so that meant it was time to get going on some teatime garden projects for the new year. Fresh herbs for teatime sipping and cooking were definitely on my radar, so I made a visit to the Walmart garden center and picked up three pots of herbs to go in my teacup planter. The planter has become cracked on one side and may not make it another year, so I'm going to be on the lookout for another one just like it. And a pot of rosemary. 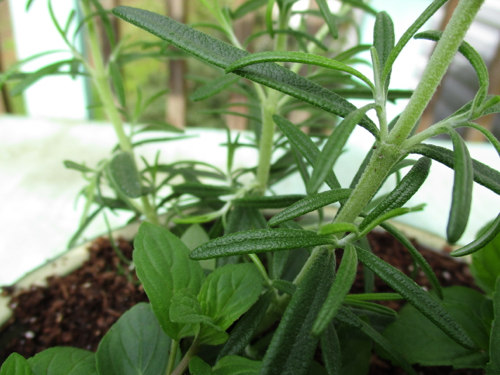 I cannot seem to walk past a rosemary plant without touching it, crushing a few leaves, and sniffing my fingers because I love the scent so much. No wonder there's the saying "rosemary for remembrance." 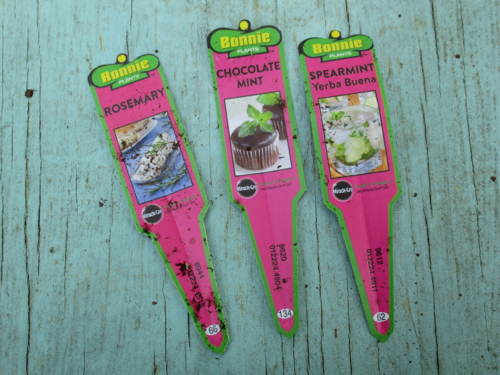 Have plant tags, will study. 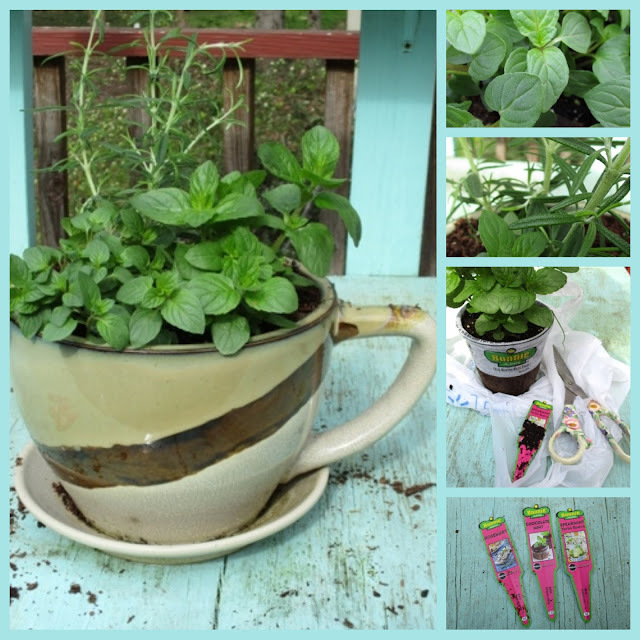 Have you planted any teatime herbs this spring? I imagine my friends up north have not, but some of you in warmer climes probably have! 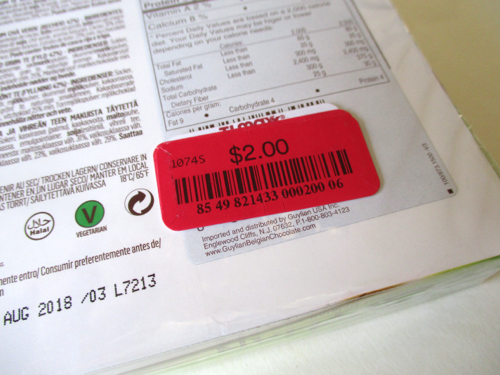 The cookies and candies for sale at T.J. Maxx, I find, can be iffy. I've bought some chocolate teacups that disintegrated the moment I opened the package, and I've bought some cookies that tasted like slightly sugared cardboard. So while I'm happy to buy teas there, I don't often try the foods. 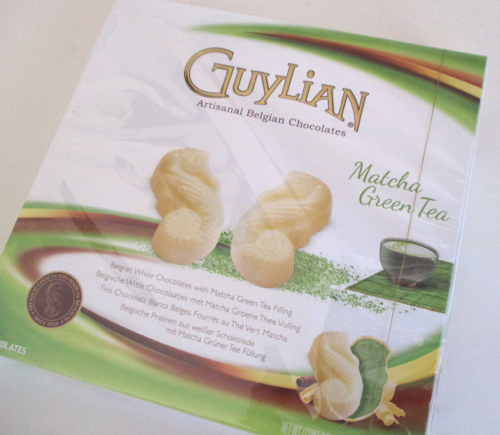 But I decided to take a gamble and brought home these Guylian Matcha Green Tea Artisanal Belgian Chocolates when I saw them there the other day. I loved the little seahorse shapes! I turned one over and was surprised to find some milk chocolate along with the white chocolate shell. Where was the matcha? 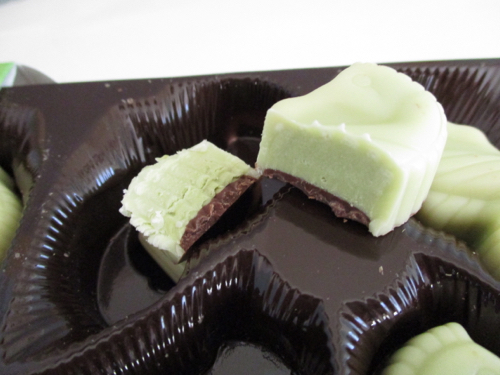 I had to slice one open to confirm that the matcha filling was inside. (Or I could have just bitten into it, but that wouldn't make for a pretty photo.) And I'm delighted to report that these were absolutely delicious! 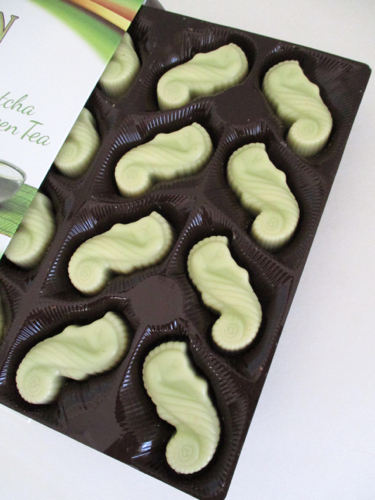 These chocolates tasted fresh and sweet with just a light matcha taste. The consistency reminded me of Lindt Lindor Truffles, of which I have long been a fan. There was only one box of these at the T.J. Maxx I visited, for an obvious reason, but if I see more, you can bet I'll be buying them! 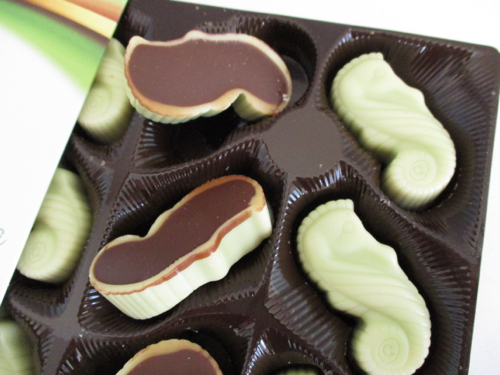 Have any of you tried these chocolates before? 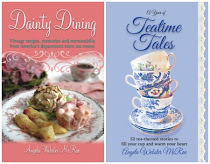 I'd love to have some of these on hand the next time I host a tea! Some new tea from a new shop! 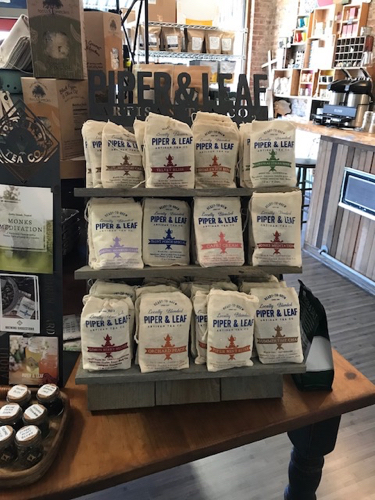 Several years ago, I learned from tea friend Denise about a new tea company in Huntsville, Alabama, called Piper & Leaf. I've not yet made it to the shop in Huntsville, but fortunately, the tea company has come to me! 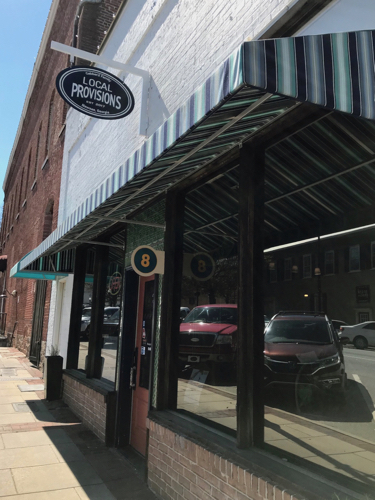 A new shop called Local Provisions recently opened in downtown Newnan, and they carry Piper & Leaf Tea! I saw the display and wanted everything on it! 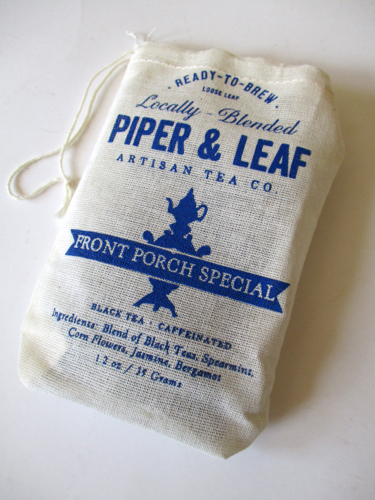 But I'll allow myself only one tea purchase at a time, and I started with the tea I've most wanted to try, their Front Porch Special blend. 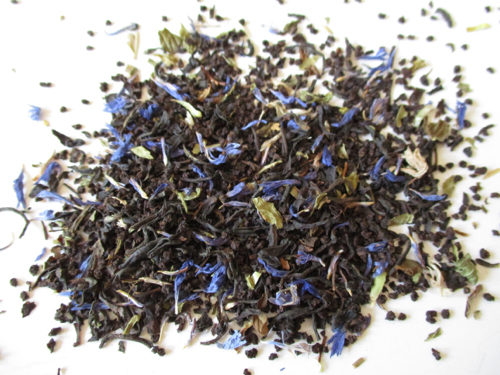 It contains black tea, spearmint, cornflowers, jasmine, and bergamot. Think Earl Grey, but softer. I loved the scent of this tea, the sight of this tea, and most of all, the lovely, delicate flavor of this tea. Count me as the newest fan of Piper & Leaf — and Local Provisions! 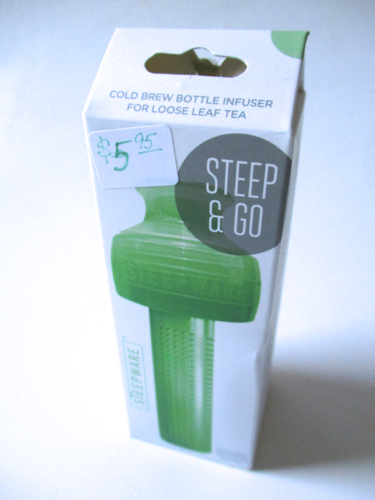 When I was in Wisconsin recently, I bought a new tea gadget that I was eager to try, this Steep & Go cold brew bottle infuser for use with loose leaf tea. The set consists of a cylindrical column with holes pierced in it, a cap (shown at left), and two different sizes of ring attachments (both shown on the column here). Just glancing at the package, I had assumed the column was supposed to then be filled with tea, but when I read the instructions, I learned that no, that is actually the part that filters out the loose leaf tea. That was surprising, and I liked the fact the loose leaf tea gets to "swim" while it is cold brewing. I was skeptical, but friends, this thing works like a charm! I cold-brewed some Grapefruit Oolong from Adagio, and it gave me the citrusy taste I was expecting, and not one particle of tea slipped past that magnificent filter! 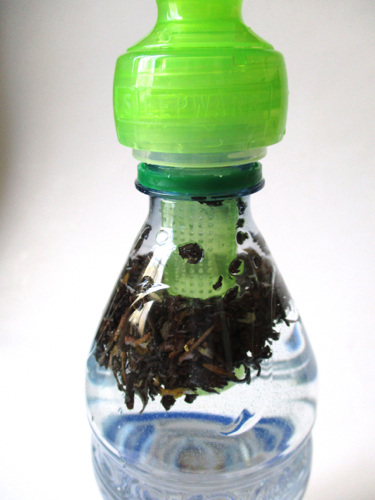 I also liked the fact it has a sports-bottle type of cap that lets you sort of squirt the tea out for sipping. Now I wish I'd bought two of these gadgets! 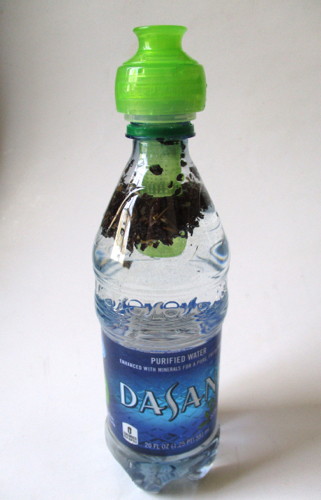 Every year I try new bottled teas, and about 9 times out of 10 I am disappointed with the flavor. Now I have an easy way to take my owned bottled tea on the road, and I couldn't be happier with this infuser. 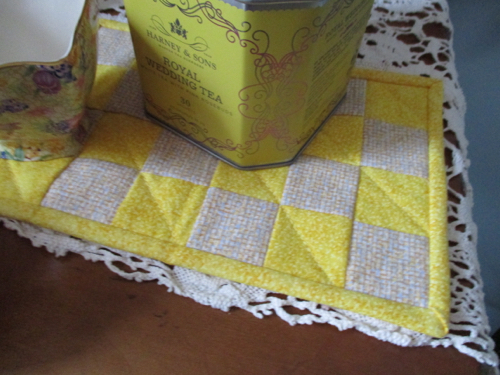 It's made by The Tea Spot, and you can find it in their Green Tea color as well as a few other colors by clicking here. Sandy Garvey! 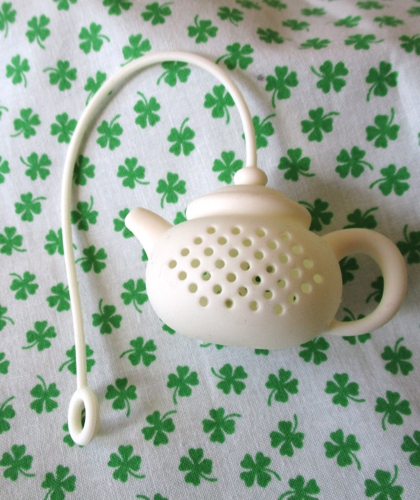 And Sandy, I've sent you an email asking for your snail mail address so I can get this new infuser headed your way. Congrats! Do you all subscribe to the emails from Fortnum & Mason in London? I do, and I do not ask for very many emails. Yesterday, I enjoyed viewing this new tea video teased in their latest email. If you view it—and it's just about a minute and a half—watch for the Bloody Mary Tea. That caught my eye. And so did this … Fortnum's is now offering silky teabags containing loose leaf tea, just as Harney and other US vendors have done for years. Even though I won't be flying to London to shop there anytime soon, I like knowing that my favorite UK department store is getting with the times and offering a more convenient form of their fabulous loose leaf tea! 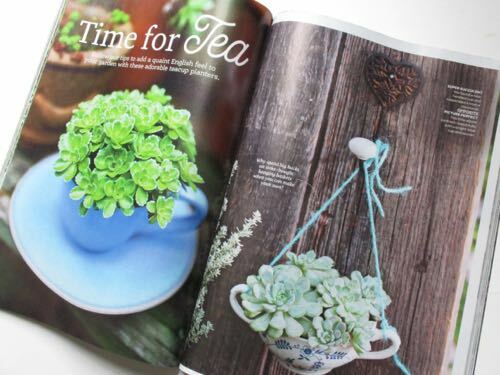 I absolutely love the new gardening magazines that appear each spring, especially the ones that promote using flea market finds as garden decor. 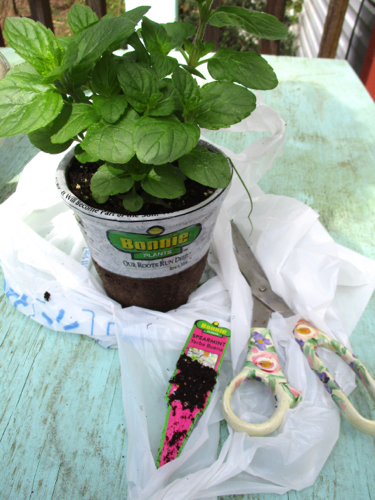 This week, I picked up Flea Market Garden Style at Walgreens and flipped through it to see if it needed to go home with me. And it did! I love sedums, and I love teacups and sugar bowls, so what's not to love about this spread? 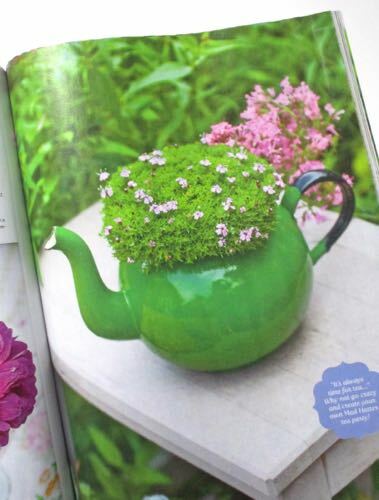 And oh, this lovely little mossy arrangement in an old enamel tea kettle is so charming! 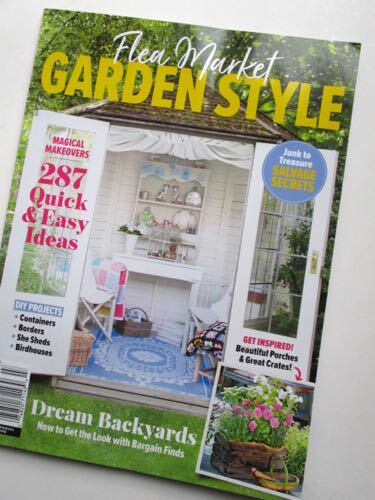 There are quite a few more winsome ideas in this issue as well, along with some "shabby chic" decor, old statuary, and vintage linens. If that sounds like your cup of you-know-what too, you might want to look for this magazine! 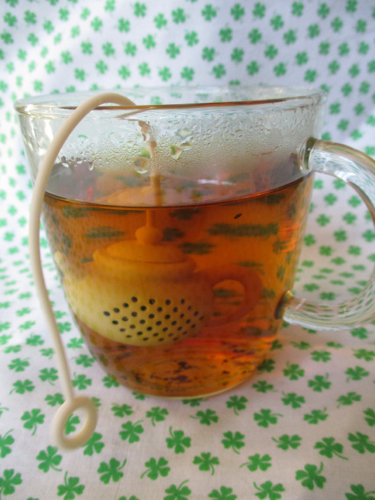 One of my favorite tea infusers is this twisting tea ball from Oxo, but last fall I got (nicely) pulled out of line at the Milwaukee airport for having it in my suitcase. Oh, it's legal and all, but that plastic handle doesn't show up on the airport X-ray machine, and the infuser looks like a sharp metal weapon. I was as puzzled as the security guy when he pointed at the scan of the long skinny object in my bag and asked me what that might be. After he reached in and pulled out the tea infuser, he laughed and waved me on through. So on my most recent trip, I meant to take an infuser that wouldn't create any problems. Alas, I forgot it, and fortunately my stepdaughter had some tea filters left over from a previous visit, but still I *mean* to keep a plastic infuser in my suitcase for use in the event of a tea emergency. (I know, I know. First-world problem, for sure!) 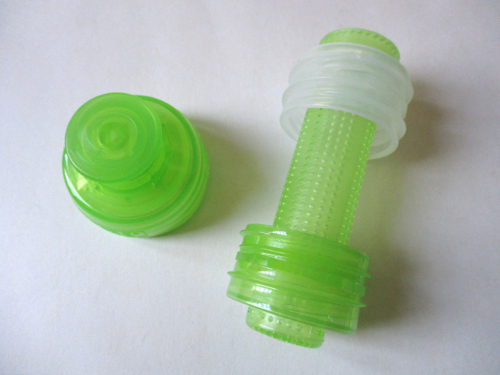 But when I found this silicone infuser on eBay for 99 cents, I decided I'd go ahead and order two, one for me and one to give away to one of you! 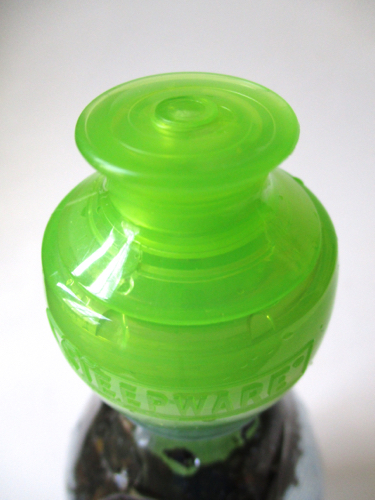 It's a pretty simple gadget to use, as the lid neatly pops off and right back into place after you scoop some tea inside. As often happens with this type of infuser, I found a few tea leaves slipping through, so I will probably keep this as my "travel infuser" rather than an everyday infuser. 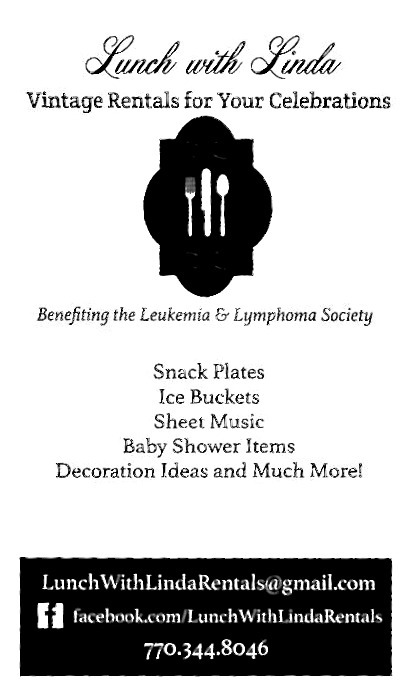 Perhaps you're headed on a trip and could use one too? 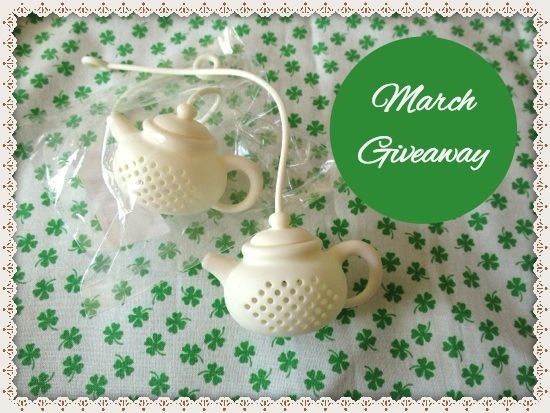 If so, just leave an "Enter me" to this post between now and 7 a.m. EST on Friday, March 9, and you'll be entered to win. US and Canada only, please. And may the luck of the Irish be with ya! Well, this is a first! 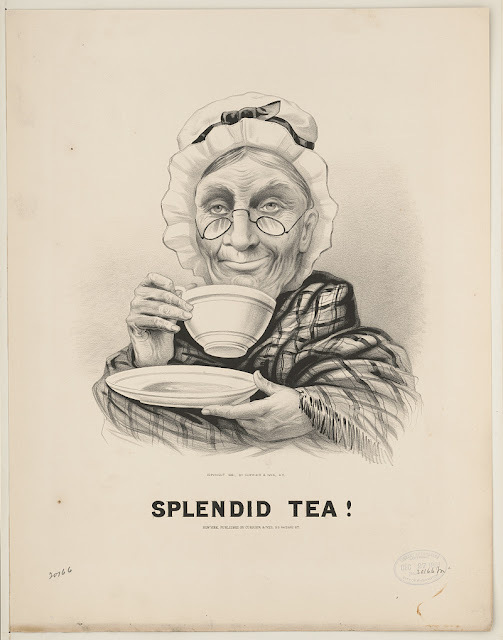 I was browsing the Library of Congress website for vintage tea images, and I found one I'd never seen before, this print from Currier & Ives that reads "Splendid Tea!" When I enlarged it, the line directly under the picture of the old lady, who bears more than a passing resemblance to a smiling Abe Lincoln, reads "Copyright 1881, By Currier & Ives, N.Y." Underneath "Splendid Tea!" it says only, "New York, Published by Currier & Ives, 115 Nassau St."
I've always associated Currier & Ives with the vintage prints of snow-laden landscapes, but I've certainly never seen any of their prints related to teatime. And what on earth do you suppose "Splendid Tea!" is about? Tea is splendid, I'll agree, but don't you think this was probably some sort of advertising piece? If you have any ideas on it, I'd love to hear them!